Communities harmed by the overseas operations of Canadian extractive-sector companies are waiting for justice. Canada is home to half of the world’s mining and mineral exploration companies. Our partners call on us to respond to the grave injustices they face—environmental degradation, extrajudicial killings, incarceration, militarization, and intimidation of community leaders opposed to government policy. MiningWatch Canada, as a member of the Canadian Network for Corporate Accountability, was greatly encouraged by the Minister of International Trade’s announcement exactly one year ago, on January 17, 2018, regarding the creation of a Canadian Ombudsperson for Responsible Enterprise ("CORE"). One year later, there is still no Ombudsperson in place. Communities negatively affected by Canadian mining companies around the world are still waiting for access to justice. The fate of the Ombuds is on the Prime Minister’s desk this week. There has been intense lobbying by industry representatives against the ombudsperson having the power to compel documents and testimony. We must match that effort with our passion for justice. Don’t let us lose the Ombuds at the last minute. Urge your Member of Parliament to call the Prime Minister’s Office today! Do it now! It is already a year since the office was announced! Hello, I am calling about the Government of Canada’s promise to create a Canadian Ombudsperson for Responsible Enterprise (CORE). the ombudsperson would have the powers needed to investigate – including the power to compel documents and testimony. It has been a full year since that ground-breaking announcement. There is still no ombudsperson in place. This is really urgent. Can I count on you to make the call today? I will be calling back every day until an ombudsperson has been named. You will often first speak with your MP's assistant before being able to speak directly with your MP. Do not despair – be polite, be firm, and keep calling back until you get through. You can practice your script with the assistant! (It is best to wait until you are actually speaking with your MP before you make the ask to call the prime minister’s office). Use the following texts to craft a social media message about the delayed ombudsperson. 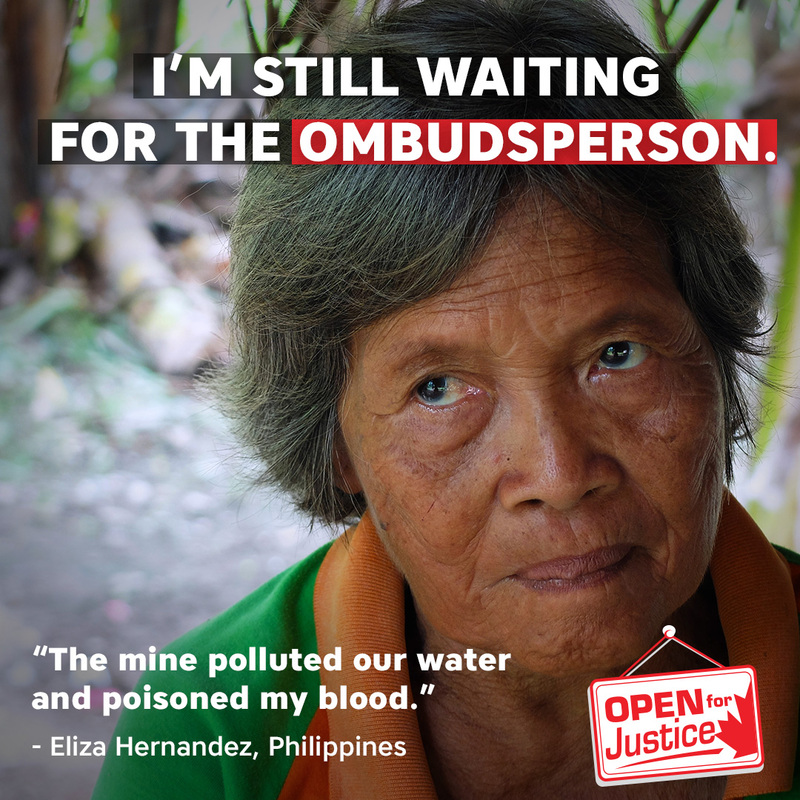 Communities negatively affected by Canadian mining companies around the world have been waiting one year since an #Ombuds with #power2investigate was announced. When will Canada be #open4justice? In January 2018, we were promised an effective #Ombuds to conduct independent investigations for communities affected by Canadian mining projects. When will we have an #Ombuds with #power2investigate? On Twitter, tag Prime Minister Trudeau (@CanadianPM) and Minister of International Trade Diversification Jim Carr (@jimcarr_wpg). On Facebook, tag Justin Trudeau (@JustinPJTrudeau) and Jim Carr (@JimCarrWSC). Use the hashtags #open4justice, #ombuds, #power2investigate. Feel free to use the images available for download here. Lastly – share this action alert on your social media networks. Use the hashtags #open4justice, #ombuds, #power2investigate.